Yehuda Glick displays a drawing of the Jewish “Third Temple” he believes should stand in the place of the Dome of the Rock, part of Jerusalem’s al-Aqsa compound, visible in the background. The Israeli narrative about the shooting of Jewish extremist Yehuda Glick raises many questions and doubts. Glick may well have been seeking to provoke Palestinian violence and got burned by his own game. The stakes could not be higher as Jewish extremists, including Glick, backed by the Israeli government are actively planning to turn this messianic scheme into reality. Escalating violence and confrontation is an essential part of their plan. For months, Israeli settlers, inspired and led by the New York-born Glick and Moshe Feiglin, deputy speaker of Israel’s parliament, the Knesset, have been escalating their incursions into the al-Aqsa compound, provoking violence and incitement against Palestinians. Last night, as he was leaving a conference titled “The Jewish people return to the Temple Mount” – the name Jews give to the al-Aqsa compound – Glick was confronted by an assailant, shot and seriously injured. “The attempted murderer turned to him and confirmed in Hebrew, in a heavy Arabic accent, that it was Yehuda,” Feiglin, who claimed to be a witness, told media. The assailant then reportedly escaped on a motorcycle. Feiglin, a member of the ruling Likud party, said Glick was in the middle of loading equipment into his car following the conference at the Menachem Begin Heritage Center. Glick predicted last week that the situation on the Temple Mount would change only after an act of violence against Jews. These accounts raise a couple of questions: if Feiglin was close enough to hear the assailant’s accent, why wasn’t he targeted as well? After all, Feiglin, who also claimed that he is the target of relentless incitement on Facebook, is arguably more notorious and recognizable than Glick. Feiglin has frequently led incursions into al-Aqsa and as deputy Knesset speaker is often in the media. During Israel’s summer massacre in Gaza, Feiglin achieved new levels of notoriety when he incited genocide by calling on Israel to “concentrate” and “exterminate” Palestinians there. Of course it may simply be that Glick was the specific target and the would-be assassin had no time to waste. According to “eyewitnesses” quoted in Haaretz’s Hebrew edition, the assailant asked Glick “Are you Yehuda Glick?” before firing three shots. Except for one instance of the letter ‘ayn, these two phrases do not contain any of the consonants whose pronunciation easily distinguishes a native Arabic speaker of Hebrew. Feiglin’s claim is suspect at best. At worst it was deliberate and calculated anti-Arab incitement. There is little doubt that as an advocate of genocidal policies against them, Feiglin would say whatever it took to incriminate Palestinians as an entire ethnic group. Despite these “eyewitness” accounts, Israeli media reports have not included any physical descriptions of the assailant. Let us recall that after Palestinian teen Muhammad Abu Khudair was kidnapped from in front of his eastern occupied Jerusalem home in the early hours of 2 July, burned alive and his body dumped in a forest, it took Israeli police days to arrest the suspects – and only after intense international pressure. This was despite the fact that they had clear video of the murderers’ faces. And let us also recall that on 15 May, Israeli snipers shot dead two Palestinian teens, Nadim Nuwara and Muhammad Abu al-Thathir, in cold blood in the occupied West Bank village of Beitunia. These murders were caught on video from multiple angles, sparking an international outcry and a US demand for an investigation. Yet almost six months later, Israel still hasn’t managed to find any suspects or make any arrests. But now we are told that barely hours after Glick was shot, the intrepid Israeli police had tracked down the “suspect” and went to “arrest” him at his eastern occupied Jerusalem home. According to the Israel Police and Shin Bet security service, the suspect attempted to evade arrest by climbing onto the roof of his house and hiding there behind solar panels. When the Police Special Anti-Terror Unit, known by its Hebrew acronym “Yamam,” closed in on the suspect, he opened fire. The unit returned fire, shooting and killing him. The Shin Bet said Hijazi served 11 years in Israeli prison for security offenses and was released three years ago after. He formerly belonged to Islamic Jihad but since his release from prison was not identified with any organization, it said. The security services said they are investigating whether Hijazi was involved in a somewhat similar attack that took place on the slopes of Mount Scopus last August, in which a man on a motorcycle opened fire at an Israel Defense Forces soldier, severely wounding him. Special forces raided the al-Thuri neighborhood near Silwan at 2:30 a.m. and began searching rooftops before shooting dead Muataz Ibrahim Hijazi, 32, after exchanging fire. Witnesses said that Hijazi was shot and unable to move or fire back, at which point Israeli forces broke into his home and went to the rooftop. The special units then threw a water tank on him as he bled to death. Chairman of a local sports club, Hani Gheith, told Ma’an that Israeli forces only broke into Hijazi’s house after they were sure he was critically wounded. Journalist Dan Cohen, reporting for Middle East Eye, who went to Hijazi’s home hours later, uncovered doubts about the Israeli version. Another neighbor, Bellal Burqan, 23, who watched from an adjacent house that overlooks the roof where Hijazi was killed described to Cohen a scene of massive police violence. “They were shooting everywhere,” Burqan said. Pointing to a broken electric drill that was visible next to Hijazi’s dead body in published photos, Burqan “sarcastically” said, “this is the only weapon he had,” Cohen adds. Hijazi was “first detained in 2000 on charges of participating in al-Aqsa Intifada. He was sentenced to seven years, but attacked an Israeli warden while in jail and so was given four more years,” according to Ma’an. One Israeli press report, citing an anonymous” employee” at the Begin Heritage Center, claims that Hijazi worked at the center’s restaurant. If that is true, and it cannot be assumed to be, it is hardly unusual: service jobs in Israeli institutions in Jerusalem are typically done by Palestinians. But being a Palestinian with a “security” record who happens to work nearby is more than enough to make one a “suspect” in Israel’s eyes regardless of any other facts. He is the perfect “suspect” – few Israelis would question the official account, especially since Hijazi served time in prison and was affiliated with Islamic Jihad. It is likely that Hijazi is part of a “target bank” kept by Israel – a list of people to be eliminated either when the opportunity arises, or as convenient scapegoats. We may never know the truth because Israeli police – apparently competent enough to track Hijzazi down within hours, but not capable of taking him alive – killed him. Dead men don’t talk. The Hijazis have now been told that their house will be demolished, Cohen adds. Glick is at the nexus of a host of “Temple activist” groups whose activities are detailed in a 2013 report by the Israeli nongovernmental organization Ir Amim. Many such groups have close ties to and receive funding from the Israeli government. As far back as September 1996, during his first term as prime minister, Benjamin Netanyahu colluded with the same Temple groups to open an “archaeological” tunnel along the foundations of the al-Aqsa compound. Many Muslims believed this was intended not just to change the status quo but to physically undermine the structure. Dozens of Palestinians and fifteen Israelis were killed in the ensuing violence. And in September 2000, it was then opposition leader Ariel Sharon’s incursion into al-Aqsa, accompanied by hundreds of occupation forces, that was the spark for the second intifada. Sharon’s action also emboldened the Temple movement. These incursions represent a gross violation of the status quo which Israel agreed to maintain after it invaded and occupied eastern Jerusalem in 1967. At that time, Israel’s chief rabbis prohibited Jews from praying anywhere in the compound on the theological grounds that they could inadvertently defile the “Holy of Holies” – the inner sanctuary of what Jewish belief holds was a temple that formerly existed on the site, the precise location of which is not known. But Glick has advanced the theory that the Holy of Holies lies directly under the Dome of the Rock. Today, this is a movement that has high-level backing from government ministers. Last year, Israeli housing minister Uri Ariel called for a Jewish temple to be built on the al-Aqsa site. “In the end we’ll build the temple and it will be a house of prayer for all nations,” Glick himself told Israel’s Maariv newspaper in 2012. And the ties to the government go both ways. According to Ir Amim, Glick “was appointed to write the Likud position on Temple Mount” before the most recent Israeli election. 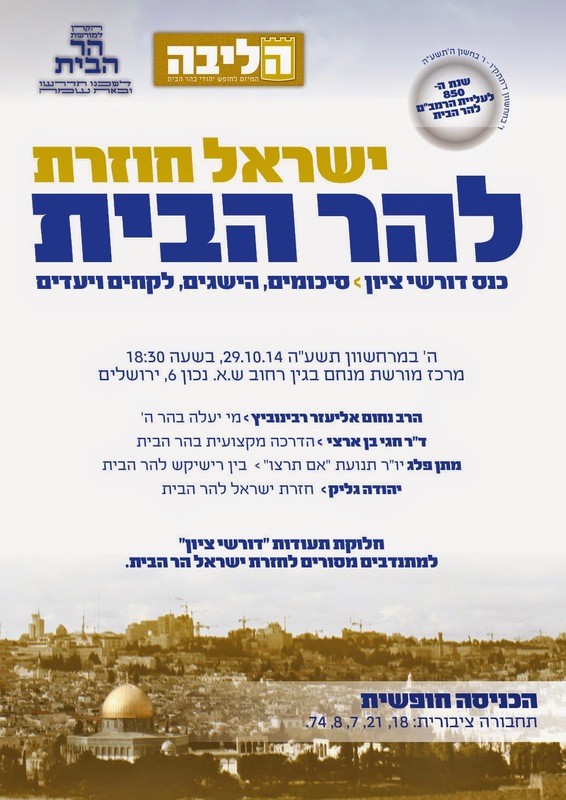 This flyer heightened Palestinian fears and tensions in the city, and Feiglin denied any role in distributing it. A website called Har Habayit Shelanu – “Temple Mount is Ours” – published the same call. As Ir Amim notes, the commander of the Jerusalem Police District at the time, Nisso Shacham, “claimed that the Har Habayit Shelanu website was operated by Yehuda Glick” and another activist, Nechemia Elboim. As a result of these provocations, hundreds of Palestinians barricaded themselves into the al-Aqsa compound and were confronted by Israeli occupation forces; some responded with stones. This violence may be what the Temple movement is after. For those who think the destruction of the Muslim holy sites is unthinkable, there is already a worrying recent precedent: the 1992 destruction of the 16th-century Babri mosque by Hindu nationalists in the northern Indian city of Ayodhya. In Hindu nationalist belief, the mosque had been built over the site of a temple marking the birthplace of the god Ram. Thousands died in communal violence and pogroms following the destruction which continues to poison India’s politics to this day. The consequences of the destruction of the al-Aqsa mosque in Jerusalem – a desecration which Jewish extremists are laying the ground for – would be of far greater magnitude. Palestinians resisting the occupation and the takeover and destruction of al-Aqsa might see Glick as a target, and that a Palestinian killed him is a plausible hypothesis. But an impartial and open-minded police investigation – something that Israeli authorities are clearly incapable of carrying out – would have to consider the possibility that the non-fatal shooting of Glick was part of a messianic settler scheme to move history forward. Immediately after the shooting, Israeli ministers began demanding a change in the status quo at al-Aqsa. Israel, reportedly for the first time since 1967, closed it to all worshippers. Some Palestinians fear that when it reopens, Israel could well seize the opportunity to impose a new situation in the name of “security”: separate entrances or reserved areas for Jews. This would be seen by Palestinians as the first slice of a takeover. This is precisely what Israel did in Hebron’s Ibrahimi mosque following Brooklyn settler Baruch Goldstein’s 1994 massacre of 29 Palestinian worshippers. If Israel does not do so this time, it may be only a matter of seizing on the next provocation. Recall that it was a Jewish extremist, Yigal Amir, who assassinated Israeli Prime Minister Yitzhak Rabin in 1995 in order to stop what he feared would be the handover to the Palestinians of land he believes God promised to the Jews. If that act remains justified in the eyes of Amir and many of his supporters, what would not be permitted to bring about the rebuilding of the Temple? We do not know who shot Yehuda Glick – it could have been a Palestinian or it could have been someone else. What we do know for certain is that Glick and his comrades have apocalyptic plans and are counting on shocking violence to help bring them about. tbh honest that's purely immoral and disrespectful not only to Islam, but to Palestine as a whole, this is part of it's identity. Israel since 1948 has been growing and claiming land and truthfully, I have no clue how people still allow this. The human race that we area is a sick and selfish species that is degenerating. This is a very dangerous move and will spur anger from every country, I don't see the reason of it. tbh. Do we know for certain that he was shot? It could all be a set up. That's why he wasn't killed, which would have been easy to do in that short range, because he is supposed to emerge in coming days, wounds healed. What do you think of apocalypticism as a belief? Particularly the Abrahamic kind? Your accounts in earlier stories of daily incursions of settlers into the courtyard of the mosque, protected by police got the hairs up on the back of my neck. Here we go again (or, more probably, it's a constant assault all over the place like this). Push, push, shove all to provoke a response, then all hell breaks loose. And reading this article, the shock of hearing because of this action, they now are going in and will demolish this family's home! We know what happens here in the United States when people say "I've had enough!" They are getting ready for it in Fergeson. It is disgusting that our federal government stands back, fully well knowing what is going on, sides with the bully and castigates the victim when they have "had enough." And it truly is a sad day when instead of our elected officials standing up the oppressed here, it is rather coming from groups around the country, blocking the unloading of Isareli ships, protesting at Israeli cultural and athletic events, supporting BDS. This needs to be kept under control by whatever sane forces may be in Israel..........that would start the mother of all holy wars. The Dome of the Rock is on the site of the old Hebrew Temples, as the rock is the "holy of hollies" mentioned in the Old Testament. Muslims and Jews have a religion that shares most of the same prophets and holy sites, even the same dietary laws. While Jews should be allowed to pray there, they can't be allowed to go up there just to start trouble in the worst place in the world to do so! I've been up there as a tourist, it's an easy place to get to from the Western Wall as long as things are peaceful there at the time. As an American Jew, I am impressed by your account of the undeniably Machiavellian rationale for stirring up Palestinian unrest by claiming this monument for Jews only and exacerbating an "extremist" response on the part of young Palestinian men so that further oppression is deemed sane policy by the US & Israel. I shudder to think of the outcome, but the world--including more American Jews than you might imagine--is reacting badly to Israeli terrorism and Zionist racism and an act of violence toward Palestinians, however much it appear "justified" will not be accepted in the court of public opinion. When American Jews--though not enough of them...yet--become disenchanted with Zionism the tide way well turn! Thanks for you excellent reportage! The Israelis have, as usual, gotten us quibbling over bogus issues that implicitly accept what they want to remain unquestioned: in this case, the lie that they have jurisdiction over East Jerusalem. The Temple Mount, etc., are not in Israel, period---any more than Stonehenge is in Israel. Anything the Netanyahus, the Yehuda Glicks, the East Jerusalem settlers, etc., do, must be refuted up front with the fact (by international law and several Security Council Resolutions) that they are invaders in other people's land. By challenging or analyzing the details, or parsing the right/wrong/who, is to hand Israel implicit "confirmation" of their "annexation". Netanyhau has reiterated the ban for Jews to pray on the Temple Mount, their holiest site. This is hardly backing Yehuda Glick, who insists upon the right of Jews to pray at their holiest site. The Israelis constantly provoke Muslims by their actions and the world is silent. they may succeed in starting a war by trying to replace the Al Aqsa with their temple,but it will surely consume all us.